Flashy indeed! This young and growing beauty is described by her trainer as an absolute sweetheart, an easy filly to deal with, very kind and quiet, good about everything and has no bad habits. 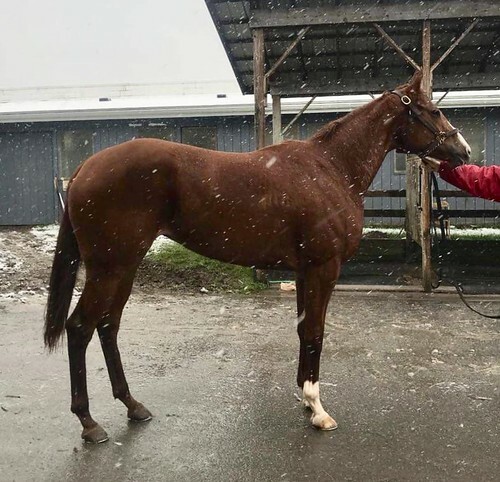 Even though Flashy Moment only recently came to Finger Lakes from Delaware Park, she has obviously quickly won her trainers’ affection, as the trainer kept raving about what a sweet, sweet filly she is. But what she isn’t is a race horse. After breaking her maiden earlier this summer, she has not been competitive at the next level of competition, so it is time to find her a new career. 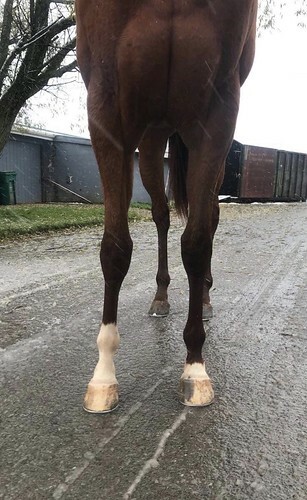 Her trainer says she is sound and her legs are clean (although she’s currently dealing with thrush in one hind foot that was there when the filly arrived at her barn). 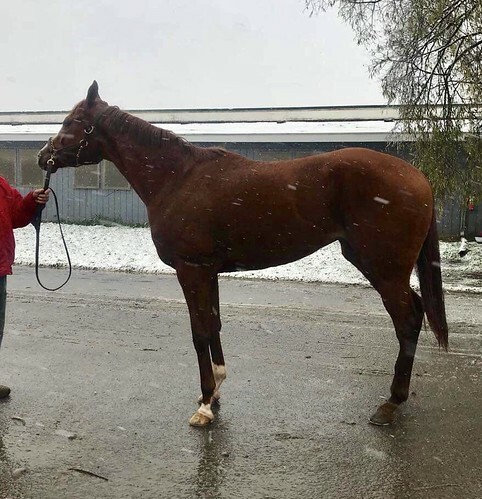 The photos were taken by her trainer right after she raced, and she stood quietly in the swirling snow and wind, and then jogged politely, showing no post race stiffness at all. 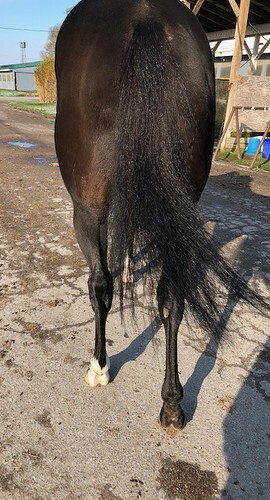 She has nice light and even movement… an impression we confirmed by watching the video of her one winning race, where we could see a fluid gallop and a light trot with great reach from the shoulders. She has a very enticing pedigree for sport. 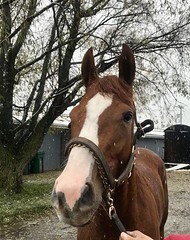 Her sire Flashy Bull is a son of Holy Bull. This line is coveted for producing horses with great brains, kind temperaments, an eager to please attitude, and great jumping ability. Everyone we know who has ever had a horse with Holy Bull close up in its pedigree always wants more! And we have placed several Flashy Bull offspring over the last few years, who have turned out to be outstanding jumpers — not surprising since his dam is from the Blushing Groom line. And on Flashy’s dam side you have A P Indy, Caro, and Raja Baba. So her pedigree is full of the sport/ H/J world’s most wanted bloodlines! All this and a bargain price for a lovely filly that has unlimited potential for any new career.